When it comes to salad, we’ll try new things, but we keep coming back to some variation of a chicken caesar salad. Whether it’s with classic romaine lettuce or with nutrient-packed kale, there’s something about the creamy, zesty dressing, and perfectly seasoned and grilled chicken that makes us turn a blind eye towards most other salads. Here, we wanted to take our beloved chicken caesar salad and spin it into more of a complete meal…we give you the chicken caesar pasta bake. With all the same flavors you know and love, this casserole is filled with grilled chicken, kale, penne pasta, cherry tomatoes and, of course, caesar dressing. Tossed together and then baked until the cheese is perfectly melted, this dish has everything you want, and you can serve it as a main course that will fill your family up! It might feel like you’re betraying the darling of the salad world, but we promise you it’s worth it, you’ll see! Preheat oven to 350º F and bring a large pot of salted water to boil. Cook pasta according to packaging directions, or until just al dente. Drain and set aside. In a large bowl, toss chicken, pasta, kale and mozzarella together with chicken broth and caesar dressing. Season generously with salt and pepper. In a small bowl, toss cherry tomatoes with olive oil, and season with salt and pepper. 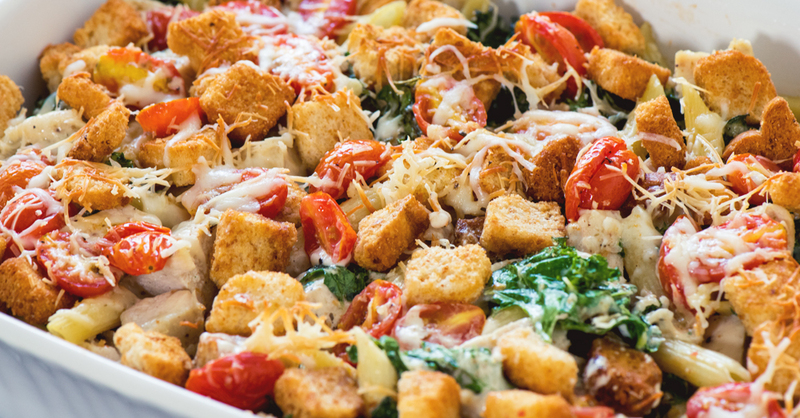 Transfer chicken kale mixture to a 9x13-inch baking dish, then top with cherry tomatoes, if using, and garlic croutons. Sprinkle parmesan cheese and bacon bits, if using, over the top, then place in oven. Bake for 20 minutes, or until cheese is hot and bubbly. Remove from oven and let cool 5 minutes. Serve warm and enjoy!